If you're having a dinner party, have little time but want to serve something impressive this is a great dish! This meal presents a most beautiful display. It's colourful, elegant, and best of all, the taste is wonderful! It's the sauce that truly makes this dish. Well, it usually is the sauce that pulls any meal together, but this sauce, in particular, is to die for! And wouldn't you know, the friends (including the birthday girl and photographer of these photos, Monique Napier) I made this for, raved about the cherry tomato garnish too! I have to admit I was very proud of that. The bright red and deep green makes the rest of the dish come to life, esthetically. The Tarragon Hollandaise Sauce can be made first. Follow the steps for the hollandaise sauce, but add the tarragon at the end with the season. 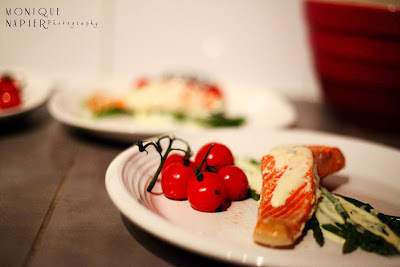 For the Salmon, I used a tradtional method of cooking in a foil bag in the oven. Perhaps I should have taken photos to show you how to prepare the foil bag. But for those who do not know, I have found a good step by step instruction here. Rub the olive oil all over the fish fillets then sprinkle with seasoning. Once the bag was made, but before folding the last seal, I pour about 1/4 cup of dry white wine into the bag with the fish. This is if you'd like the fish steamed rather than baked. I place the bag on a cookie sheet and cooked in for about 20-25 minutes at 375 degrees. For the Grilled Asparagus, after trimming the asparagus, I simply tossed the asparagus in olive oil. Place the asparagus, small bunches at a time (you want each spear, touching your hot grill pan). Turn them around once they start charring. This should only take about 5-10 minutes per bunch (depending on how thick the spears are). You'll know they're ready if you can easily get a fork through. TIP: a fool proof method of trimming asapargus is just by using your hands. No knife needed! :) Hold the asparagus at each end and bend. It will break at the right spot. Check here for a more detailed explination, if you're new to trimming, or even cooking, asparagus. To garnish I grilled some cherry tomatoes left on the vine. They were on the grilled for about 2-3 minutes. Just until they were charring and softened. Trust me, you will feel pride when plating up this elegant dish!